The singlestick is the primary training weapon for all one-handed sword methods. 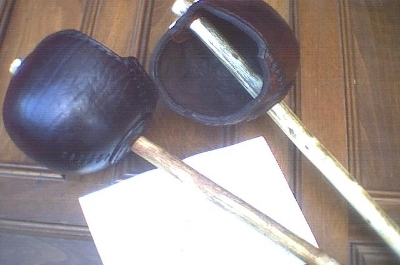 This is an ash stick equipped with a strong wicker or hardened leather basket to protect the hand and is the same training weapon used extensively by western swordsmen for centuries. 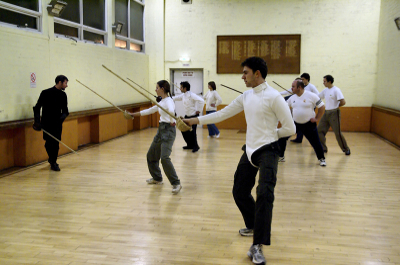 All students begin by using the singlestick and are required to follow tuition in the backsword as a single sword form for at least six months before being individually assessed for Free Fencing. After passing their Free Fencing assessment, students are allowed to employ steel weapons when appropriate and receive more advanced technical backsword tuition. 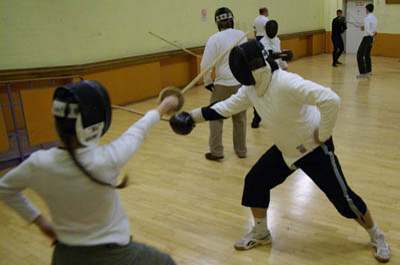 Free Fencing students are also welcome to request lessons in their preferred choice of weapon or martial form, including longsword, smallsword, rapier (Spanish or Italian), quarterstaff, Italian cane or classical foil, as well as off-hand weapon combinations such as rapier/dagger and broadsword/targe. 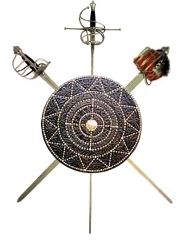 Every different weapon is a different tool for a different job, with each speaking it`s own specific martial dialect within the language of the Art. Training in any weapon is intensive, exciting and demanding. Each lesson develops the martial artist`s ability to command time, measure and strategy in any encounter by employing specific techniques to control mind, body and weapon effectively. Classes take place on Monday nights from 8pm to 10pm. 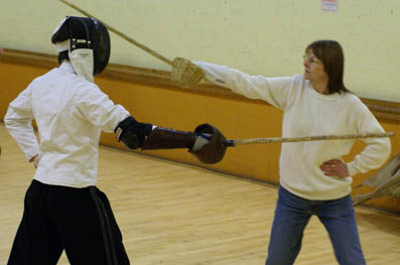 The Academy Method of backsword is also taught at the Academy's sister school, The Cat's Glove. The first class is always FREE and thereafter fees are payable in advance and in accordance with regularity of attendance. A registration fee of £20 is also payable annually. New students are accepted on the first Monday lesson of each calendar month. Outside of Academy hours, private individual or group lessons are available to all interested parties from within or without the Academy structure in their choice of weapon.